Our sweatshirt blankets and waterproof blankets are great for protecting you from the elements, but wouldn't they be even more practical with a hood? Just in time for Fall, we've added a collection of multipurpose hooded blankets to our cozycoverz.com store that provide the ultimate in versatility. Take it to the game, hiking, camping, or just relaxing. 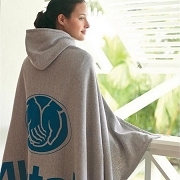 All of our hooded blankets can be decorated with your school or company logo. The make great corporate gifts, team gifts, or fundraisers.